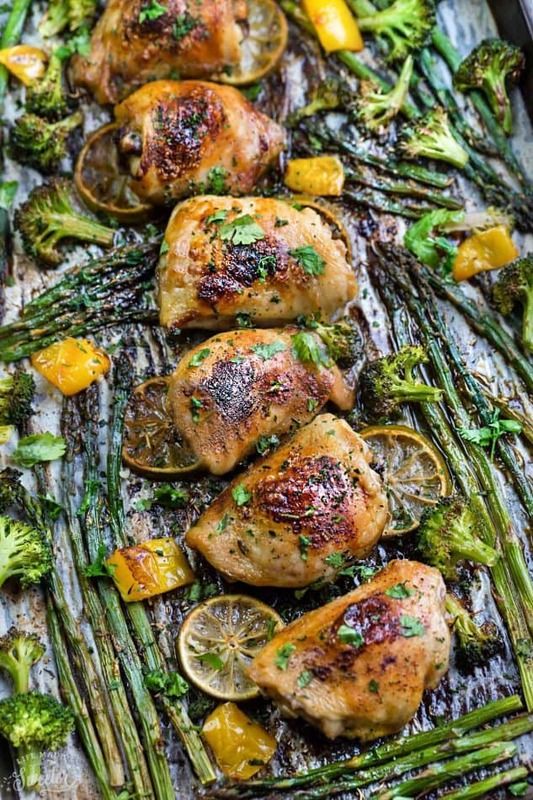 Chicken Asparagus Sheet Pan – Simply the best dinner for busy weeknights. 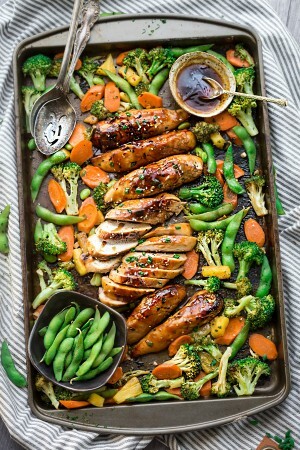 Best part of all, can be made in just ONE sheet pan and full of tender asparagus and broccoli. Prep the vegetables the day before and store in a large zip-top freezer bag. Whisk the ingredients for the sauce the day before and store in a resealable container in the fridge for up to 5 days. Combine the seasonings ahead of the time and store in a jar or resealable container. If serving with rice, quinoa or pasta, make a big batch and store in a large resealable container in the fridge. This batch works great for meal prep on Sundays and leftovers make great work or school lunch bowls for the rest of the week. Side of your choice: rice, pasta, quinoa, farro, potatoes etc. Preheat the oven to 400ºF. Spray a large sturdy baking sheet with cooking spray or for easier clean-up, line with parchment paper or heavy duty foil. 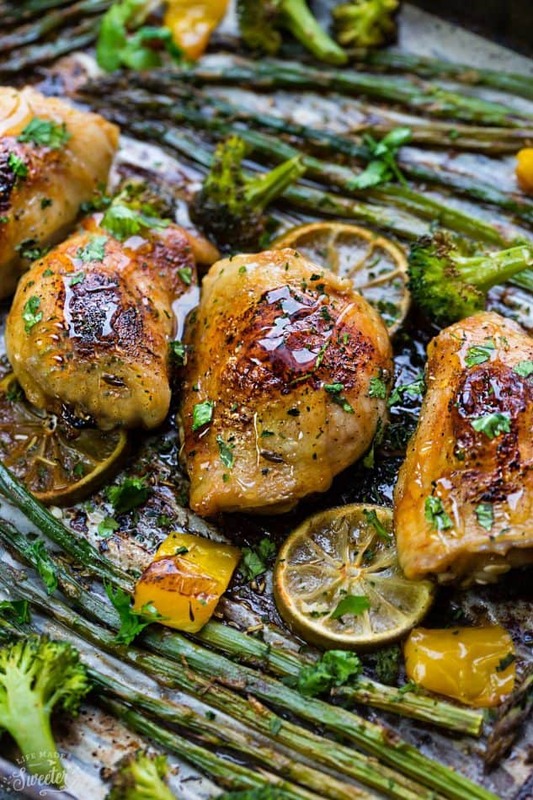 Place the chicken thighs on the prepared baking sheet. Season with salt and black pepper to taste. In a small bowl, combine the soy sauce, lime juice, honey, sesame oil and cilantro together. Drizzle 1/3 of the sauce over the chicken. After 20 minutes, remove baking pan from the oven, flip the chicken and place the asparagus, broccoli and bell peppers along the sides of the chicken. 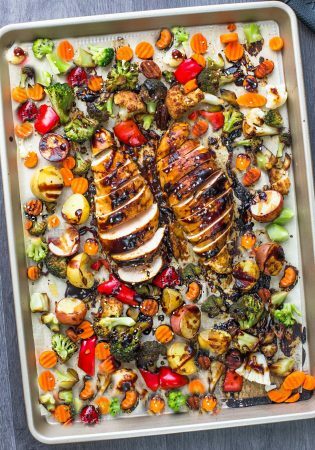 Sprinkle the chicken and vegetables with seasonings and drizzle sauce over the vegetables and some more on the chicken (reserve 1 teaspoon for the end). 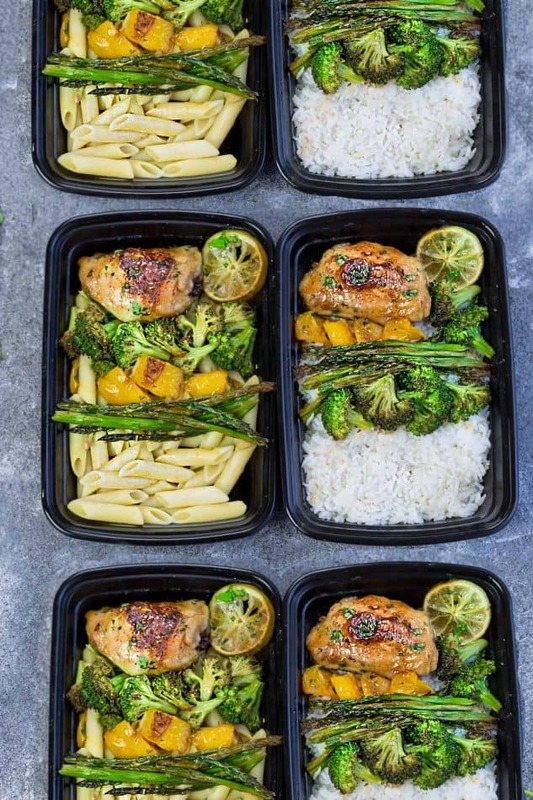 For meal prepping: Make the rice, potatoes, quinoa or pasta while the chicken is cooking. Divide evenly into lunch containers and store in the fridge for up for up five days.